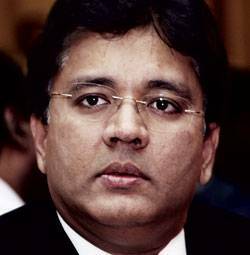 When Sun TV's net profit went up by 17.6 per cent in 2015/16, its Executive Chairman Kalanithi Maran's annual compensation also rose 16.6 per cent. With Apollo Tyres' net profit rising 32.2 per cent in 2015/16, Chairman and Managing Director Onkar S. Kanwar got a raise of 28.2 per cent. Ramco Cements' net profit increased a staggering 130.4 per cent in 2015/16; accordingly, Chairman and Managing Director P.R. Ramasubrahmaneya Rajha got a whopping 92.5 per cent increase in yearly emoluments. 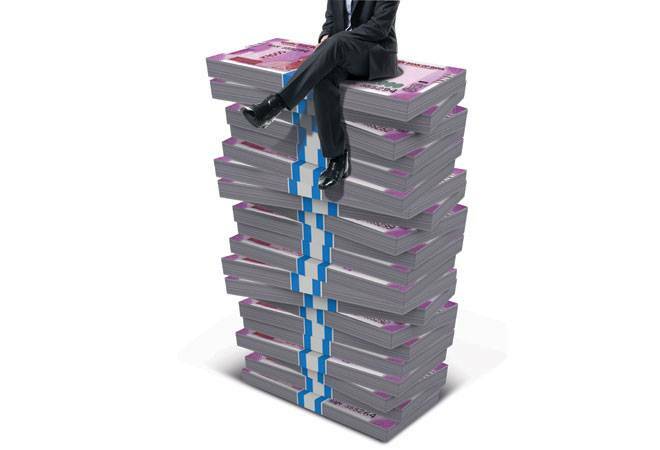 The list of the highest-paid executive heads of BSE 500 companies in India includes seven promoter-executives - those of Sun TV, Hero MotoCorp, Apollo Tyres, Divis Laboratories, Lupin, Amara Raja Group and Ramco Cements - and three professionals: A.M. Naik of Larsen & Toubro, C.P. Gurnani of Tech Mahindra and Vishal Sikka of Infosys. With the former group, the correlation is straightforward - their average emoluments increased 0.69 per cent against every 1 per cent rise in bottom lines of their companies in 2015/16. This is hardly surprising, considering promoter-CEOs are in a position to decide their own remuneration. "All directors on a company's board - which has to endorse executive salaries - owe their presence on it to the promoter, even when they are independent directors," says an HR head of a global workforce management solutions company who did not want to be named. "Mostly, they do not question the promoter-CEOs' compensation." This is true even when promoters, as in some of the above seven seven cases, while retaining their positions, have largely passed on effective control of their companies to their sons and daughters. For different reasons, no similar link can be established for professional CEOs in the top 10 list. Vishal Sikka joined Infosys only in 2014, so no comparison with previous years is possible. Gurnani's income dropped 72.6 per cent in 2015/16, compared to the previous year even though Tech Mahindra's net profit rose 42.7 per cent, but that was only because he had exercised a part of his stock options in 2014/15, resulting in his total income that year going up a massive 539 per cent. Again, A.M. Naik's income spiked 142.3 per cent in 2015/16 compared to the previous year, even though L&T's net profit that year rose just 5 per cent, mainly because he got a one-time "perquisites compensation" of Rs38.85 crore. HR experts maintain that there is no direct correlation between a company's profits and its professional CEO's total compensation. "A significant amount of compensation is linked to the individual's potential in the eyes of the company's board, how it views his/her ability to turn around the company and lead it in the future," says Rituparna Chakraborty, President, Indian Staffing Federation. "But the size of salary packages shows that the new-age companies are compensating their CEOs well." "It is also because companies want the top executives to be happy," says J.K. Agrawal, Managing Director, BTI Consultants. "If the company is doing well, credit goes to the CEO. If it isn't, they still get a pay increase because the company doesn't want their motivation to get impacted." 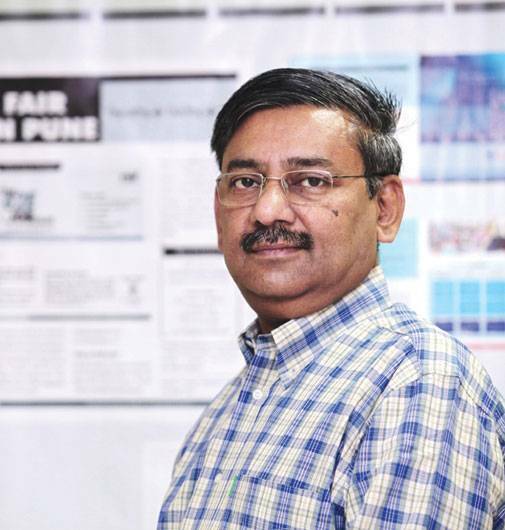 However, if bonuses or commissions paid to CEOs are looked at separately, and the list of highest-paid professional CEOs expanded from three to eight - including Aditya Ghosh of Interglobe Aviation (Indigo Airlines), N. Chandrasekaran of TCS (in 2015/16, before taking over as Chairman of Tata Sons), D. Bhattacharya of Hindalco Industries, Y.C. Deveshwar of ITC and Sanjiv Mehta of Hindustan Unilever, a clear connection does emerge. In seven cases out of eight, if the CEO's variable pay has risen, so has the company's profit after tax (PAT) and total income. "The rationale of variable pay ensures that CEOs get properly paid only if they deliver," says Suresh Raina, Managing Partner, Hunt Partners, an executive search firm. The exception is Hindalco's Managing Director D. Bhattacharya, whose variable pay (performance bonus) rose to Rs6.87 crore in 2015/16 from Rs6.34 crore in 2014/15, even though his company's PAT declined to Rs607 crore from Rs925 crore the previous year. The reasons could be two-fold: first, all companies dealing in metals - Hindalco is a global leader in rolling aluminium - have suffered lately due to a global price crash and are only slowly recovering, and second, Bhattacharya has spent 13 years with the company, during which its market cap rose from Rs9,026 crore to Rs27,557 crore. "Earlier, a professional CEO's relationship with his company's promoter was much stronger and he would stay much longer with a company," says Raina. "Businesses were smaller and CEOs were paid a lot more in kind, such as company accommodation and gifts." Overall, in the top 100 companies by market cap, compensation of CEOs - promoter-CEOs and professionals lumped together - has risen at a compound annual growth rate (CAGR) of 18 per cent between 2011/12 and 2015/16. (See Perks Rule.) But separate statistics also show that the rise has been mainly in variable pay - while variable pay increased in the range of 150-300 per cent in the same four-year period, the CEOs' fixed pay rose a mere 7-20 per cent. While the variable pay component of the CEOs' salary was earlier between 20 per cent and 40 per cent, it is now 40-60 per cent in large-cap companies, according to Aon Hewitt data. Even promoter-CEOs earn most of their salary from bonuses and commissions - bonus/ex-gratia comprised 81.6 per cent of Kalanithi Maran's remuneration in 2015/16, 77.15 per cent of Onkar Kanwar's. Variable pay is of two types: short-term incentives (STIS) such as bonuses and commissions and long-term incentives (LTIS) like stock options, restricted stock (which can be transferred only after prescribed time conditions are met) and performance shares (which can be transferred only after prescribed time and performance conditions are met). "Increasingly, and more so in large-cap companies, the LTI component of the variable pay has been increasing and is now between 30 per cent and 50 per cent," says Anubhav Gupta, Head, Executive Compensation and Governance, Aon Hewitt. "The division between STI and LTI ensures that CEO compensation is not just driving quarter-on-quarter performance, but is also linked to long-term value creation." Companies that have an objective to get listed or raise funding and are seeing a certain growth spurt use LTIs to share wealth, says Sonu Iyer, People Advisory Services, Partner & Leader - India Region, EY. Not surprisingly, within LTI, too, restricted stock options and performance shares are gaining ground. According to Aon Hewitt data, the prevalence of these two has gone up to 37 per cent and 29 per cent, respectively. Compared to stock options, restricted stock and performance shares are a more equitable means of compensation, since stock price is often temporarily affected by factors which have nothing to do with the CEO's performance. Indeed, some HR experts feel that the nature of incentives provided to CEOs, short term or long term, should be regularly re-examined. In fact, another important factor that is closely being watched is the metric on which variable pay is to be paid out. The key defining metrics of business performance vary for each sector and CEO's incentives should reflect the progress on company's objectives, rather than only absolute outcomes, says Iyer of EY. The overall idea, she says, is that the executive's pay should reflect the company's performance. "Sink and sail with the organisation is the spirit with which executive pay is being structured." As compensation increases in coming years, its variable component is likely to get even bigger. In the West, the variable component of a CEO's pay is as high as 89 per cent (STI and LTI combined) in really large companies. (See Performance Is All.) Indian companies are trending in the same direction. However, with increased focus on pay for risk, the caveat here is that it is fine now as the economy is growing, but if any of macroeconomic factors worsen, there will be a very different dip that will happen because of variability in pay, says Iyer of EY. But while CEOs are prospering, there has been no commensurate trickle-down effect. Average salaries in even highly prosperous companies are not increasing the way CEO emoluments are. "The rise in CEO salaries is creating a disproportionate disparity with the median wage of the company," says Shelly Singh, Chief Business Officer, PeopleStrong, a HR services firm. The salaries of company employees, both executive and non-executive, have been rising at a much slower pace. 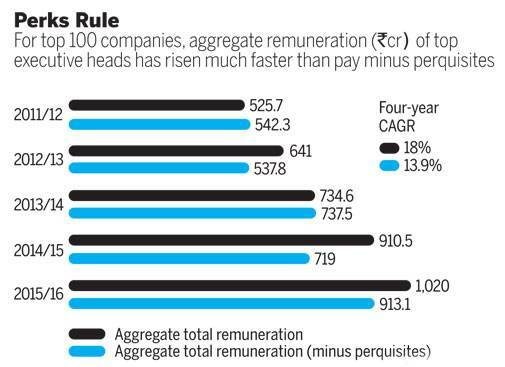 Growth in non-executive employee remuneration across companies has been 8 per cent to 10 per cent in the last two years, while that of executives has been around 20 per cent. Worryingly enough, for the former category, salary growth has been slowing, falling to 8 per cent in 2015/16 from about 17 per cent in 2012. For executives, it has increased from 9 per cent in 2012 to 23 per cent in 2015/16. The current ratio of total emoluments of the top 10 executives of a company to its median salary is a staggering 700:1. Among professional CEOs, the ratio is around 500:1; for promoter CEOs, it is 900:1. In comparison, in the US, the CEO-to-worker ratio at 168 companies with revenues over $1 billion was 70:1, according to a report by US board intelligence solutions provider Equilar. "It shows promoter-CEOs are brazenly taking care of themselves," says an HR consultant, who prefers not to be named. "They pay themselves whatever they feel they can get away with. A company's success depends on teamwork. No one drives growth all by himself, especially in large conglomerates. But India has borrowed the US concept that a great CEO makes all the difference - an erroneous idea that arose after Jack Welch as CEO transformed GE." 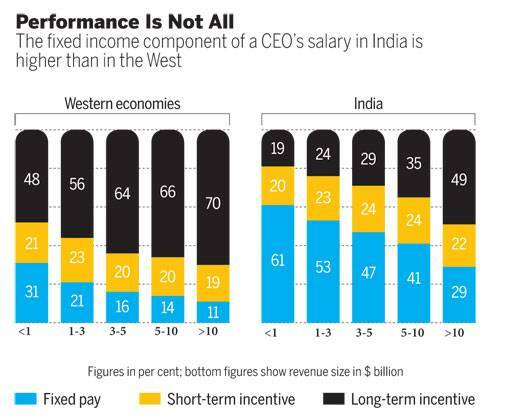 Raina of Hunt Partners, however, suggests that the additional pressures on Indian CEOs - compared to their Western counterparts - justify their high remuneration. "There are only two or three top players in most sectors, which put great pressure on CEOs of these companies to maintain their leadership position," he says. "These companies are also expected to grow much faster than those in the West, because India is a growing economy." Hindustan Unilever, for instance, is growing at 8-10 per cent in India, whereas globally the company's revenue is increasing at only 3-4 per cent. "A company's function also determines the median wage of its employees and in turn its ratio to the CEO's income," says Raina. A company such as Infosys has to employ a large number of coders and software engineers, whose market value is relatively modest - hence the gap between the median wage and the CEO's salary would be high. In contrast, Tata Communications, for instance, which builds communications infrastructure, would have fewer but more highly-paid specialists, reducing the salary gap. Besides, having brought in a global CEO - Vishal Sikka was formerly with SAP in the US - his earlier salary had to be surpassed. A number of other Indian companies - such as Tata Motors, currently headed by Guenter Karl Butschek, formerly with Airbus in the US - have also appointed global CEOs who have to be compensated accordingly. Some HR leaders also feel that a company's median salary depends on numerous factors such as the percentage of workforce on rolls and on contract, and the percentage based in India and outside. T. Muralidharan, Chairman, TMI - a recruitment agency, strikes the middle path. "A CEO's contribution to his company's profitability is much more than that of the average employee," he says. "His salary increase could be two or three times that of the company average, but beyond that it isn't quite right." The market cap of the top 100 BSE companies is growing at a slower pace than the total remuneration of its executives, which shows that companies are paying more than before to retain top talent. Job creation and employee headcount are reducing as large companies increasingly turn to automation. 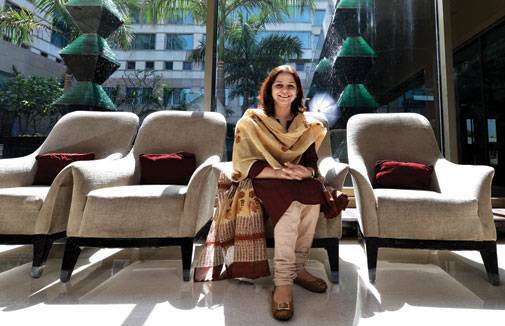 "In fact, it is themid-sized companies which are creating more jobs," says Raina. There is also the possibility that the widening gap between CEO (and top executive) remuneration and that of the average employee may lead to shareholders asking uncomfortable questions. It has happened in the US. In India, too, a start was made by Infosys founder N.R. Narayana Murthy recently, when he questioned the rationale behind a 55 per cent increase in Vishal Sikka's compensation. But HR experts are sceptical about the trend catching on. "It happened only because Murthy is now a shareholder," says Muralidharan. "Usually, as long as they get their dividends, shareholders don't raise any such concerns. Perhaps the financial institutions, which are these companies' biggest creditors, should begin to raise questions."